When you gaze out at the night sky what can you see of our galactic home, the Milky Way? Certainly there are many types of individual deep-sky objects to be explored - variable stars, multiple star systems, open star clusters, globular clusters, emission and reflection nebulae, planetary nebulae, dark nebulae and supernovae remnants. Anything else? Well, yes. If you know where to look and what to look for, you can trace the paths of at least three spiral arm segments as they sweep around the galaxy. Other large-scale features, such as gigantic star birth regions, are observable as well. However, before getting to the specifics of these structures, a description of the latest thinking of professional astronomers on just how the galaxy is put together should make visualization of these large scale structures easier. The Milky Way galaxy has a flat disk shape (in roughly the proportions of two stacked CD disks) with a central bulge whose main part is about 7,000 light years (ly) in diameter. The disk itself is roughly 2,000 ly thick. The central bulge is slightly flattened at its poles and is elongated being perhaps twice as long as it is wide. The Milky Way, therefore, seems to be a barred spiral galaxy, midway between types SBb and SBc. From the ends of these short bars two "grand design" spiral arms sweep out and around the galaxy. These two arms, the Norma/Outer Arm and the Sagittarius Arm, would appear to an external observer to be largely continuous. Other arms are either offshoots of these major arms or discontinuous spiral segments (or in some cases alternative names for the same features or portions of larger features). Thus to an external observer the Milky Way would appear to be a cross between a grand design spiral such as M100 with its distinct continuous arms and a flocculent galaxy made up of discontinuous segments with no sweeping arcs such as M63 or M33, the Triangulum Galaxy. M61 has been cited as a galaxy that may be similar to the Milky Way in appearance. Now lets take a look at how the Sun is situated with respect to the elongated central bulge and major spiral arms. The disk of the Milky Way is about 100,000 ly in diameter. This marks the rough limits of the star bearing area. However, the dust and gas extends another 30,000 ly beyond this boundary, making the entire disk about 160,000 ly wide. The Sun is currently near perigalaction, 27,000 ly from the center (with apogalaction being about 30,000 ly). The center of the galaxy is located about three degrees above and to the right (as seen from the Northern Hemisphere) of the spout of the Sagittarius "Teapot" asterism. The long axis of the oval shaped central bulge points generally toward the sun to the left (east) of center and away from the sun to the right of center. A line drawn from the sun to the center of the galaxy intersects the long axis of the central bulge at angle of about forty degrees to the east (and, of course, 140 degrees to the right). From this nearer end of the central bulge, the Norma Arm begins. It is known as the 3 Kiloparsec Arm in this region. In the direction of Scutum, the Scutum-Crux Arm branches off the 3 Kiloparsec Arm, while the main Norma Arm continues on around to the other side of the galaxy. These structures are not visible optically being blocked by intervening dust and gas  and the Sagittarius Spiral Arm. The Sagittarius Arm, the other grand design spiral arm, emerges from the further end of the central bar some 140 degrees around on the far side of the galaxy. Curving around the far side of the galaxy, this arm finally begins curving back toward us and comes into visual range in the constellation of Scutum. Outer portions of the Sagittarius Arm, where in begins to curve back toward us on its outward spiral, are obscured by dust in Aquila. We begin to see this arm, in the direction of open clusters M11 (the Wild Duck Cluster - 5,700 ly) and M26 (slightly closer), both of which are denizens of the Sagittarius Arm. Here we are looking at the arm curving almost directly toward us. This is dramatically illustrated by the dense concentration of stars in this area, the Scutum Star Cloud. This cloud is, of course, the accumulated light of numerous stars stacked up along our line of sight along the length of the arm. Further to the right and southwest, the arm, although still coming closer, begins to move more edge on to our line of sight. Moving along this arm as it continues to spiral out closer to us, we come in succession to the Eagle, Omega, Trifid, and Lagoon Nebulae (M16, M17, M20, and M8 respectively). These nebulae all lie within about one-degree of the galactic plane and comprise one gigantic star birth region. M16, the furthest of these, lies at about 8,000 ly, while the closest, M8, is around 5,200 ly distant. The cluster NGC6530, in the Lagoon, is only two million years old. These four nebulae make up one end of the still active portion of a massive but patchy molecular cloud that extends on through Scorpius and into Ara. This molecular cloud has largely turned into stars within only the past ten million years. Roughly four degrees further to the right and south of the Lagoon, we pass through our line of sight to the galactic center (zero degrees galactic longitude) and the Sagittarius Arm begins to move away from us as it spirals further out from the center of the galaxy. The further end of this star birth region is marked by NGC6231 in Scorpius, a cluster of brilliant blue and white stars, about five million years old. Moving further along the Sagittarius Arm and into areas not visible from northern latitudes, we come to the Carina star birth region. This region stretches along the spiral arm for 5,000 ly from Crux through an edge of Centaurus and on into Carina. First up in this area is the Jewel Box, NGC4755. This brilliant cluster, which includes Kappa Crucis, is about seven million years old and though nearly 8,000 ly away is visible to the naked eye. (Nearby in the sky lies the foreground dark nebula, the Coal Sack, only 400 ly from us.) Next, we come to IC2944, a gaseous nebula that is in the process of being dispersed by the stars born within it, IC2948. The cluster IC2948 is also seven million years old. A bit further on is NGC3576, a bright diffuse star bearing nebula also a part of the Carina complex. Next is the great Carina Nebula (NGC3372) itself. Although 9,000 light years away, it is easily visible to the naked eye and appears to be twice the size of the full moon. Several associated young star clusters surround it. The nebula itself is essentially a star forming region that has developed on the edge of a giant molecular cloud several times larger than the visible portion. Stars have been forming for about two million years in the Carina Nebula. This nebula is also home to the famous star Eta Carina, a prime near term (in a few hundred to a few thousand years) supernova candidate. Perhaps two or three degrees further along the galactic plane (at very roughly 285 degrees galactic longitude), the Sagittarius Arm begins to curve back around the galaxy so that its further parts as seen from our vantage point now lie behind portions we have just reviewed - primarily the Carina region. A great example of this perspective is NGC3603. This nebula, although lying adjacent to NGC3576 (see above text) along our line of sight, is actually about three times further away - 25,000 ly. To see NGC3603, we look through nearer portions of the Sagittarius Arm to its further extents as it curves back around the galaxy. It is more than twice as massive as the Carina Nebula and is the most massive star forming region in our galaxy visible to optical telescopes. Beyond this point the dust becomes too thick to optically detect any more of the Sagittarius Arm. However, radio and infrared studies tell us that the arm finally trails off making a bit more than one complete turn around the galaxy. Next we come to the Local Arm, also known as the Orion Arm. Nearly all the bright familiar stars that make up the constellation figures lie closer than 1,500 ly to the sun and are members of the Local Arm. The Local Arm is a discontinuous arm segment (or perhaps segments) lying very roughly about 3,000 ly further out in the galaxy than the main Sagittarius Arm of which it may be an offshoot(s). We begin our tour of the Local Arm in Cygnus. One of the main features of spiral galaxies which we observe are the dark lanes of dust which tend to line the inner edges of spiral arms. This is just what we see in Cygnus. The Great Rift, a dark cloud of molecular dust lining the inner edge of our Local Arm, stretches from the area between Deneb and Gamma Cygni, through Aquila, and into Serpens and Ophiuchus where it broadens and moves north of the Galactic plane. This broadening is the effect of perspective as the dust lane moves closer to the sun. This band of clouds continues into the southern constellation of Vela but is not nearly as apparent to the naked eye. The narrow further end of the Great Rift is, however, readily apparent to the naked eye because it is generally surrounded by the glow of the Cygnus Star Cloud. The Cygnus Star cloud is composed of the combined light of many, many stars stacked up behind each other along our line of sight along the length of the Local Arm (or Cygnus Arm as this portion is sometimes called) back toward its junction with the Sagitarrius Arm. It is interesting to note that along the northern edge of the Great Rift from the vicinity of Gamma Cygni south and west for about ten degrees the rift lies very nearly on the galactic plane. The northern edge of the rift in this area also marks the brightest portions of the Cygnus Star Cloud. Denizens of this region include NGC6888; an egg shaped nebula, visible in amateur instruments, which has been formed by a star ejecting massive amounts of its gas. NGC6888 is about 4,000 ly distant. The Veil Nebula, the brightest portion of which is designated NGC6992, is a supernova remnant lying about 2,500 ly away. The North American Nebula (NGC7000) and Pelican Nebula (IC5067-70) along with Deneb, which may be associated with them, are about 1,800ly distant. These nebulae are parts of the same cloud of gas with a cloud of dark dust hanging in front of them. The entire nebula is over 100 ly in diameter. Moving from the Cygnus region along the inner part of the Local Arm we come to the Dumbbell (planetary) Nebula, M27, 1,250 ly distant in Vulpecula. Moving further south and west, the stars of the Sagittarius Teapot along with Antares mark the inner edge of our arm. Moving still further south and west, we come across the Coal Sack Nebula in Crux, a dark molecular cloud 400 ly away. From here the Local Arm passes on into Vela. IC2395 in Vela is a small open cluster, which is intrinsically very bright since it can be seen in binoculars and is over 4,000 ly distant. Now lets return to Cygnus and trace the outer edges of our Local Arm. Moving in the other direction, north and east the outer edge passes first through Cepheus. Cepheus contains at least three regions of star birth about 2,800 ly away. These are, however, largely hidden by dust. Notable, is Delta Cephei, the prototype Cepheid variable. The Local Arm now moves through Cassiopeia, Camelopardalis, Perseus, and into Auriga. Many of the more interesting objects in Cassiopeia lie in the next arm out, the Perseus Arm. M34, a pretty open cluster, visible even from urban sites in small instruments, lies in Perseus 1,800 ly from the sun. A bit further on is the California Nebula, NGC1499, roughly 1,000 ly away. Located near Mirfak, alpha Persei, is the Perseus OB3 Association also known as open cluster Melotte 20. This group of young blue-white stars, along with the orange supergiant, Mirfak (also known as Algenib), all formed together about 30 million years ago. Its a lovely area for scanning with binoculars. The entire complex is about three degrees in diameter and several of the brighter members are easily visible to the naked eye. The Perseus OB3 Association, located a bit over 600 ly away, is the center from which a vast region of star birth has been triggered known as Goulds Belt. Well take a closer look at Goulds Belt a little later. Next in line is Auriga. Like Cassiopeia, the more interesting objects lie in the Perseus Arm. The point in the plane of the Milky Way that is in the direction exactly opposite to center of the galaxy (i.e. galactic longitude 180 degrees) lies in this region of the sky. It is about four degrees east of Al Nath (Beta Tauri). Moving a bit further along the galactic plane we come to the bright open cluster M35. At 2,600 ly, M35 seems to fall within a patchy boundary area where the Local and Perseus Arms (or segments) seem to merge. Finally, we come to the outermost limits of the Local/Orion Arm lying several thousand ly away in Monoceros, Canis Major, and Puppis. In the direction of Puppis and Vela we are looking almost directly down the end of the arm opposite Cygnus. Open cluster M41 in Canis Major lies at a distance of 2,500 ly. Open clusters NGC2451, M93, M47, M46, and NGC2477 lie at distances of 1,700 ly, 3,600 ly, 3,800 ly, 6,000 ly, and 6,200 ly respectively. If the Local Arm is sometimes called the Orion Arm, where does the constellation Orion fit into the picture? The Orion area actually lies well out of the plane of the Milky Way. Most of the prominent objects in Orion (with the possible exception of Betelgeuse at 300 ly), from Rigel at 900 ly to the great Orion Nebula itself at 1,600 ly are associated. Rigel and the three Belt Stars, Alnitak (1,100 ly), Alnilam (1,200 ly) and Mintaka (2,300 ly) are the more prominent members of the Orion OB1 Association - all born from same molecular cloud. This association of the Belt Stars and surrounding area is catalogued as open cluster Collinder (CR) 70. The Orion area is, in fact, a small portion of a much larger structure. There is a flattened, oval shaped appendage (or flipper as some have described it - although on the scale of the galaxy that overstates things a bit) which dips both above and below the plane of the galaxy at angle of about 18 degrees to the plane. Most of the bright stars from the Lyra-Hercules region through Ophiuchus, the head of Scorpio, Lupus, Centaurus, Crux, (where we pass from above the plane to below it), Carina, Puppis, Canis Major, and finally into Orion are related. It has also been shown that many bright and dark nebulae lay strung along this region as well. Radio studies have shown that local interstellar gas also forms a tilted system that coincides with this region. Several separate regions of star birth line the edges of this oval shaped region. It is thought that this huge outwardly expanding ring of star birth was triggered some 30 million years ago when a virgin cloud of gas and dust was compressed in the local spiral arm initiating a single burst of star formation. The intense radiation and supernovae explosions of these initial stars in turn compressed surrounding gas and dust triggering a second wave of star formation. Over the intervening 30 million years, this wave of star formation has spread outward to its current limits. This region, which varies from 1,200 ly to 2,000 ly across, is named after the first astronomer to describe it - Benjamin Gould. By measuring the speed and direction of the gas at the edge of Goulds Belt, it is evident that the wave of star formation began in the region of the Perseus OB3 Association centered on Alpha Persei or Mirfak. Next, we move yet farther out into the galactic hinterlands to explore the Perseus Spiral Arm. The Perseus Arm, which is three to four thousand light years broad, appears to be a spiral segment similar to the Local Arm. It lies further from the center of the galaxy than does the Local Arm, but is interior to the main Norma/Outer Arm. We begin our tour of the Perseus Arm at the open cluster M52 in Cassiopeia, which lies just north of the galactic plane at about 112 degrees galactic longitude. It is about 5,200 light years (ly) away and lies at the nearer edge of the Perseus Arm. Other objects which lie more or less along the inner portion of the Arm include NGC7128 (7,500 ly), IC1442 (5,500 ly), NGC129 (5,300 ly), Berkeley 62 (6,200 ly), and NGC957 (6,500 ly). Objects lying along the outer edge of the Arm include NGC7510 (10,000 ly), Harvard 21 (10,500 ly), NGC146 (10,300 ly), Berkeley 4 (11,000 ly), Berkeley 3 (10,700), and King 4 (10,800 ly). Numerous clusters and nebulae lie between these extremes within the Arm proper. A few of the more notable objects include NGC7788 (7,500 ly), NGC7790 (9,600 ly), King 14 (9,100 ly, and center of the Cassiopeia OB4 Association), NGC281 (8,100 ly), and NGC637 (7,800 ly). NGC457is an open cluster easily visible with a modest instrument from urban areas. The brightest member of this cluster, phi Cas, is a magnitude 5.7, yellow supergiant (spectral type F5), 9,500 ly away. Phi Cas is one of the most luminous stars in the galaxy. About three degrees to the northeast of NGC457 is M103, located near Ruchbah (Delta Cas). This bright open cluster is 9,200 ly distant! NGC457 and M103 reside on opposite sides of the Cassiopeia OB8 Association. Seven degrees further east, at about 135 degrees galactic longitude, is the famous Double Cluster, h and Chi Persei (NGC869 and 884). Each of these clusters is about 7,300 ly away and together form the heart of the Perseus OB1 Association, a group of young stars about 750 ly in diameter surrounding the two clusters. H Persei is about five million years old while chi Persei is somewhat younger at three million years of age. Since the association lies about 500 ly (and roughly three degrees) below the galactic plane, it appears to be a structure similar to Goulds Belt. In other words, a (former, in this case) star forming region extending well out of the galactic plane. At a similar galactic longitude but much closer to plane of the galaxy in far-eastern Cassiopeia lie the huge but faint emission nebulae IC1805 and IC1848 (including an embedded open cluster, which shares the name). Both lie about 7,900 ly away. As we have just seen, the entire stretch of the Perseus Arm from the vicinity of M52 to the Double Cluster is continuous. It is studded with young open clusters and a number of dark molecular clouds that are still actively forming stars. However, between the Double Cluster and the Crab Nebula (M1) there are very few of the young open clusters and nebulae which usually line spiral arms. Nonetheless, one my personal favorites, open cluster NGC1245, lies in this area. At a distance of 7,500 ly, this cluster reveals itself as a rich sprinkling of numerous minute points. 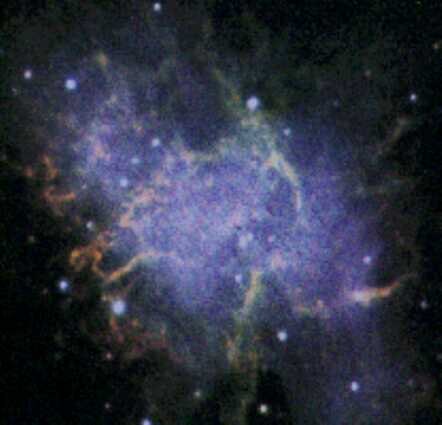 Beyond the Crab, we begin picking up clusters and nebulae again, but the structure is more uncertain. Taken together, these characteristics seem to confirm that the Perseus Arm, like the Cygnus/Local/Orion Arm, is not a continuous grand design type arm sweeping around the galaxy. Rather, it is a somewhat patchy partial arm segment similar to the ragged appearance of portions of many other spiral galaxies. Indeed, in the area of Auriga-Gemini-Monoceros the Perseus Arm appears to almost merge with the Local Arm. This makes assigning this or that object to a particular arm somewhat problematic. Since this boundary area or juncture is seemingly so patchy and ill defined, it becomes almost a matter of definition. So, for purposes of this discussion well say that the bright Auriga open clusters, M36, M37, and M38 are in the Perseus Arm. The three bright Auriga open clusters, M36, M37, and M38, all lie at similar distances in vicinity of 4,000 ly and are actually related. They are the main components of the Auriga OB1 Association. M37 and M38 both lie near the edge of the association. They range in age from 20 million years for M36 to 300 million years for M37, which is easily the most impressive visually of the three (though all three are excellent objects). Similarly, the Rosette Nebula (NGC 2237-9) and open cluster NGC 2244, at a distance of 5,500 ly in Monoceros, are in the midst of the region where the Local and Perseus Arms seem to merge. Other objects in this general area which may be considered to lie in the Perseus Spiral Arm include NGC1778 (4,800 ly), IC2157 (6,200 ly), NGC2129 (6,500 ly) and NGC2174 (7,600 ly). This completes our survey of the large-scale structure of the Milky Way. This article arose out of a desire to understand how what I was I seeing through my Celestar 8 (8" Schmidt-Cassegrain) was positioned relative to the sun and the rest of the galaxy. To me it seems only natural to wonder when youre looking at an open cluster or nebula, " just where exactly is it?" Now, the text time you scan the Double Cluster, you can amaze and delight (or a least mildly impress) your observing partners by relating that "the Double Cluster lies about 7,300 ly away, is in the Perseus Spiral Arm, and is the heart of the Perseus OB1 Association which spans 750 ly and consists of thousands of young stars born in they same stellar nursery". Well, maybe not. "The Guide to the Galaxy", by Nigel Henbest and Heather Couper, Cambridge University Press, 1994. This was the primary source for this article. Its highly detailed - I only scratched the surface of the many objects and structures described. It contains a series of very nice maps, at different scales, which show the relative locations of the many objects and structures covered in the text. I highly recommend this book. It is excellent. "The Alchemy of the Heavens", by Ken Croswell, Anchor Books, Doubleday, 1995. I used a lot of information from this book too, especially concerning the overall dimensions of the galaxy. This is also an excellent book that I can highly recommend. "Universe Guide to Stars and Planets", by Ian Ridpath and Wil Tirion, Universe Books, 1984. "The Cambridge Star Atlas", by Wil Tirion, Cambridge University Press, 1996.